Czech Challenge - Pro Ambitions Hockey, Inc. Pro Ambitions Hockey competed in the Czech Hockey Challenge Cup (CHCC) for the second time this past August. The competition was excellent and included teams from Russia, the Czech Republic, Slovakia, Latvia, Sweden, France and Canada. We are excited to return this summer with six Pro Ambitions Seal Teams. 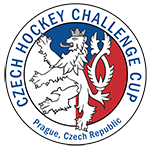 The 2019 CHCC will take place from August 4-August 11 in Prague, Czech Republic and will consist of one exhibition game before the tournament begins as well as five guaranteed games (15 minute stop time periods). Pro Ambitions will be fielding teams at the 2004, 2005, 2006, 2007, 2008, and 2009 levels for this year’s tournament. In addition to the hockey, all players, parents and guests participate in several scheduled events and sightseeing tours throughout the beautiful city of Prague. The official Tournament Party is one of the highlights of the trip and includes a catered dinner and refreshments capped off with a phenomenal fireworks display. A tour of a Crystal Factory and a Dinner Cruise on the Vltava River gives everyone an opportunity to enjoy the culture of the Czech Republic. There is ample time every day for anyone who wants to shop or sightsee on their own. Two meals are included daily and games are normally completed no later than 5:00pm which leaves plenty of time every day to enjoy Prague with your family and friends. Accommodation at Hotel Hilton Prague, BEAUTIFUL hotel in walking distance to all old world sites on the river, restaurants, cafes, John Lennon Wall, Castles, amazing roof top lounge for happy hour for all of the Pro Ambitions teams and coaches daily (http://www.hiltonprague.com/domovska-stranka.html) for 6 nights. We can help you if you would like to extend your stay at The Hilton on either end. There is plenty of time for meals and exploring on your own as well. It is the perfect balance. You will love the trip, the competiton, the hotel, the tour guide, the coaches, the excursions, the food. Fireworks Dinner Gala (proper dress required, collared shirts)at one of the old world hotels of the city. Courtyard buffet meet your European competitors. Beautiful buffet dinner, music, DJ, gelato, fireworks, amazing evening. Motor coach for your team for the whole stay. Each team/bus has a private guide with them the entire week all day, your coaches are with you all week to all excursions meals, intimate experience. You will love your guides and also get to know them well. They have been amazing trouble shooting individual family needs. We have been impressed with our tour guides and have requested all of the same ones from last summer. 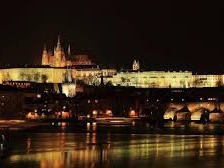 Prague guided city tour and the following excursions crystal factory, castle, river dinner cruise with all of The Pro Ambitions Teams, Concentration Camp (very emotional excursion). Awesome city to explore on your own as well. One of the most beautiful cities in Europe, hands down. Practice Aug. 5 before tourney starts. Challenger Hockey staff during the stay are at your disposal for questions. Rinks are conveniently located around the city, all within 10-30 minute drive. Tournament Jerseys/Socks/custom sublimated by Pro Ambitions and sponsored by Bauer. Your gear will be mailed to you be careful in ordering proper size for tournament uniforms, more on this if you join us. Book your flights to arrive in Prague to join us at The Hilton on Aug 5 meaning your will be departing the USA on Aug 4 on an overnight flight of your choice. We have lowered the price to allow folks to purchase their own flights because we have found it preferred after analyzing the pros and cons of traveling as a group. There was not a savings for families and it is easier for them to chose their own travel. The hotel is 15 minutes from Prague airport, a short and inexpensive taxi ride. The competition is amazing. You will be playing teams from Russia, Sweden, Czech Republic, Ireland, Canada, UK, Slovakia, Germany and more. 2019 Pro Ambitions Seal Team 2007’s – Garrett Allen Director of Operations Pro Ambitions/Hd Coach Pro Ambitions 5 years. Please contact Jeff Serowik (js@proambitions.com) for any questions pertaining to the tournament or special requests you may have for your family. European flights typically depart the USA in the evening and arrive in Europe morning or midday the following day. Note that we will not be able to check into The Hilton Prague until 2pm Monday August 5, recommending folks depart the USA on Sunday August 4th(unless you will be making plans on your own to stay in Europe before or after the tourney). We will have a hospitality room set up with refreshments if you arrive at the hotel before 2pm. Our first practice will be Monday Aug 5th between 3-6pm. Once we get the exact schedule of game and practice times closer to the tournament we will send all details out. Our first tournament games will be on Tuesday Aug 6th. – Families can fly home Aug 11 Sunday Morning. How do I sign up to play for one of your teams? You email Jeff Serowik (js@proambitions.com) TODAY. Jeff will help guide you through the process. Who will we be playing? Teams from all over Europe. Russia, Sweden, United Kingdom, Ireland, Latvia, The Czech Republic and more. Can my son or daughter attend without a parent? No. Each player must have one parent or guardian accompany them. Most players last summer brought their entire family. We welcome that and plan for all of them. 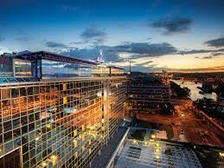 All of our teams will stay together at The Hilton Prague. Located right on the river. Last year we realized which hotel would be best for our group. We as Americans want a full American breakfast, strong air conditioned rooms, ICE in our drinks are a few things to name a few that were a challenge at the historic hotel we chose last year. We know everyone will love The Hilton Prague. The week is carefully well planned. How does it work? Every team has a detailed daily schedule. It is extremely organized. Every team will have a daily game. We utilize three different rinks around Prague. Each team will have an excursion and game daily, again at different times. Breakfast and Happy Hour in the late afternoon is a time when you will see parents and coaches and players and parents from all of the teams back at the hotel but during the day each team was off in a different direction with their parent or family. What are the excursions in Prague? -Dinner and cocktail river cruise. This is awesome. -Terezin Holocaust Concentration camp. Theresienstadt concentration camp, also referred to asTheresienstadt ghetto, was a concentration camp established by the SS during World War II in the garrison cityof Terezín (German: Theresienstadt), located in German-occupied Czechoslovakia. This is a very moving experience. -Glass blowing factory outside of Prague. -Private guided city walking tour. The city is absolutely beautiful -The John Lennon Wall -Celebration Dinner Party Gala for all teams from all over the world with the most incredible fireworks. This took place at our hotel last summer, where it will take place again. In the historic courtyard of the hotel. It is an amazing display of fireworks and celebration. We, as Americans, were in shock at the magnitude of the fireworks in a small space. Something that would never be allowed her in The States. Yes. Plenty of time to go out on your own to dinner. Now that we are staying at The Hilton. You are in the heart of the old world city. Walking to beautiful restaurant and cafes. Amazing location. You will love it. Also you will find that your dollar goes very far in The Czech Republic which is refreshing. Beers and Beer Gardens everywhere. We only have two dinners planned as a group. A few lunches. And breakfasts daily. You will enjoy exploring the beautiful city on your own or with teammates and families. You will make a lot of new friends. Meeting your new teammates from across The Nation. How is this experience? It was amazing. You have met friends both players and parents for life. Hockey people are great people. Many of our kids from last summer want to come back with the same exact team to compete again. It was awesome. The kids and parents were THE BEST. High level. As we have said before some of the teams are incredibly skilled. A few of our teams lost to Russian and Czech teams with scores of 22-3 and 12-2. Although this was a horrible beating, players, families and coaches were amazed by the skill and organization of their hockey systems. The style of hockey is very different in Europe. We epitomize American grit. The Europeans play with more finesse and focus on technicality of finite hockey skills. We have hired the Russian and Czech coach along with Sweden’s top youth hockey skill developer to train our American players next spring and summer at three locations. Italy Sweden and Prague. This is a different experience, focusing on individual training. Will this make me a better hockey player? 100 percent Yes. This experience is culturally and athletically an eye opener. What is the uniform for tournament play? Included is a game and practice jersey. Custom Bauer. Custom Bauer Tournament tees and jackets and baseball hats as well. We must look good to play good. We make our presence known. The Americans are here to compete with our flag on our jerseys. Awesome. Who can help me make travel arrangements? The Pro Ambitions Prague trip was the perfect balance of hockey and international travel. The competition was great, families were amazing and seeing a new European city was a lifetime experience. It was a trip my family will never forget. Thank you for including us! Thanks Pro Ambitions The Madden Family! Thanks so much for taking all of them! Best tournament for meeting great kids and people!!! Hope to watch our kids play together again!! The Dunnes had a terrific experience, and good luck to all the boys with their upcoming seasons. Jeff, Thank you so much for giving Indiana an experience he will cherish the rest of his life. He made lifelong friends on the trip and I did as well. It was great hockey and every game we had was competitive- which is all you can ask for. Indy and I really enjoyed meeting your amazing wife and daughter and wish her the best of luck at Harvard. Indy is friends with her on all social media and will be keeping a close eye on her and cheering her on! ALL the Best until our next great adventure. Hi All, It was greeting meeting everyone. Casey had a great time. I posted about 150 pictures up on my website. You can find them at 85×200.com under the Spring Hockey tab. Feel free to download and share however you like. No doubt Zach and I had an absolute blast. I called Zach’s group the Posse. The boys jelled so well they had a ball walking together to the pizza place and probably knows that hotel from rooftop to basement. Testosterone kicked in at these games. Confidence was there but we obviously were also playing against referees. One game had if I am not mistaken almost or over 21 minutes total in penalties for the game. Zack loved all the penalty kills he skated. Zach says the boys plan to reunite for next summer. I told him it is up to the parents. On that thought, count the Cestero’s in for Sweden and Prague maybe even Italy. This time wife Milli has to come. Bob, Just wanted to put in writing and let you know Dominik and I had a great time with Pro Ambitions in Prague. Your PA team and event planners were super with the weeks events and Darina did a fantastic job meeting and following up with everyone. Especially want to let you know that our coach, Matt Nee was amazing the whole trip and really made our experience both on and off the ice a memorable one. From him running our two practices seamlessly after just arriving and incessantly ‘coaching’ our boys from the bench it was a great hockey experience. Even more importantly, I witnessed Matt bonding with each and every kid on our ’07 team off the ice; not picking any favorites in the short time we had together – which after experiencing dozens of coaches I can say is a rare thing. Even with his wife and new baby there, Matt went out of his way to always be with the team for everything and every ride. I think I can speak for our entire ’07 families in that Pro Ambitions has a great asset in Coach Matt. Hi Jeff, We had an amazing time in Prague and couldn’t have imagined having a better coach than Matt! Thank you so much for the opportunity for Evan to play on the 07 Seal Team!! We are very interested in the Italy opportunity in April! We look for to additional communication! Jeff and ProAmbitions Prague team I wanted to thank you for a truly wonderful weak. As you stated we had some challenges that we had to overcome. We were one of the families that got their equipment on Tuesday as it arrived during the 1st period of our first game. Your wife, Dairine and your team behind the scenes went above and beyond to assist us in getting his equipment back. My wife Ami and I can’t thank everyone enough! With that said, I think that losing the equipment for two days, helped our team create a tighter bond. Everyone on our team and families on other teams immediately started offering up extra equipment. Next thing I knew we had skates, elbow pads, shoulder pads, pants and a stick. If I had to purchase equipment it would have been very limited due to the generosity of everyone on the trip. Ultimately we did not as Dairine came flying up to the rink and the crisis was averted. Brett has been speaking non-stop with his Prague teammates since getting back and not only do they want to play in another overseas tournament together they want to attend an overnight camp together. A unique bond for life. Having Billy as a coach was a real treat as the boys loved playing for him. We had a trip of a trip of a lifetime and it was directly related to all the little things you and your staff did! Jeff , Just wanted to tell you how much fun the Boys had in Prague playing hockey and making new friends. It was a family experience we will never forget ! The hockey was awesome and I think the European style was very important for them to get to play and experience first hand . Maura and I also made a lot of new friends including your Wife and daughter! If you get a 03 & 05 team together for Italy next summer count the Casey’s in ! Hope to see you at the club sometime soon .